I decided that I would close out my 2015 reviews with a cigar that I have always wanted to smoke, but somehow have never got around to, the Padrón 1964 Anniversary Series in Maduro. Although Casas Fumando has reviewed other 1964’s previously, it’s been a while, and none involved this particular vitola. I will admit that although I’ve had a number of the core line cigars before, this is my first foray into the upper echelons of what Padrón has to offer. It always helps to have friends who will see to it that one is able to broaden their horizons, and this one came to me through the courtesy of my good Minnesota friend Josh Peterson. The cigar has a rather handsomely rustic look to it and comes draped in an extremely dark and mottled wrapper, firmly rolled with invisible seams leading to a somewhat lopsided and wrinkled single cap. It feels downright hard, especially in the boxed corners. Because it comes uncellophaned and has been sitting in my humidor for a month, the wrapper doesn’t have as much of a distinct aroma to it that one might expect. Light earth and tobacco are pretty much all I get off the wrapper, while the foot gives up more discernible scents of sweet spice, tobacco, and herbs. A shallow cut is all that is needed to provide an ideal draw that shows some sweetly spiced tobacco on the cold draw. The Padrón 1964 Anniversary Series maduro starts out with smooth sweet cedar, earth, and leather, along with a nice peppery bite. It has what I can only describe as an aged tobacco feel to its underpinnings, as sweet coffee comes into play. The burn line is sharp and even, leaving behind a thickly layered ash. An inch in, the 1964 has taken on a a creaminess to complement its medium body and a toastiness has emerged as it continues to burn flawlessly, dropping a solid 1 ¼” ash. The 1964 Anniversary Series maduro Exclusivo enters its middle section continuing on its medium-bodied way, as it flashes toasty cedar, mocha coffee, spice, and peppery pungency on top of that smooth aged tobacco background. 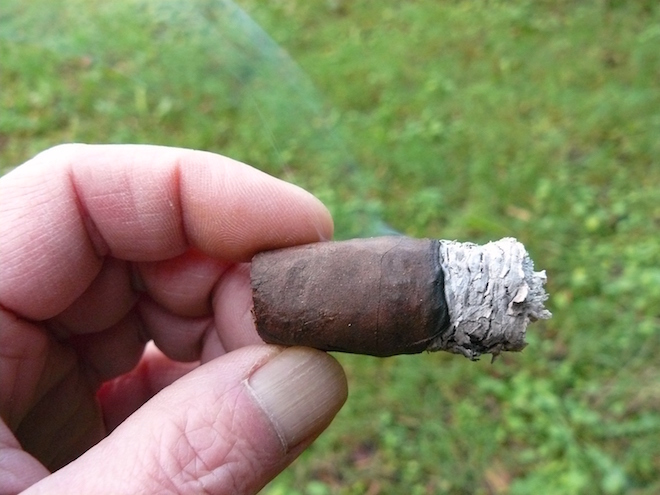 The ash finally falls on me after another 2”, and the cigar is still incredibly smooth, while picking up even more sweetness and bite on the back end. 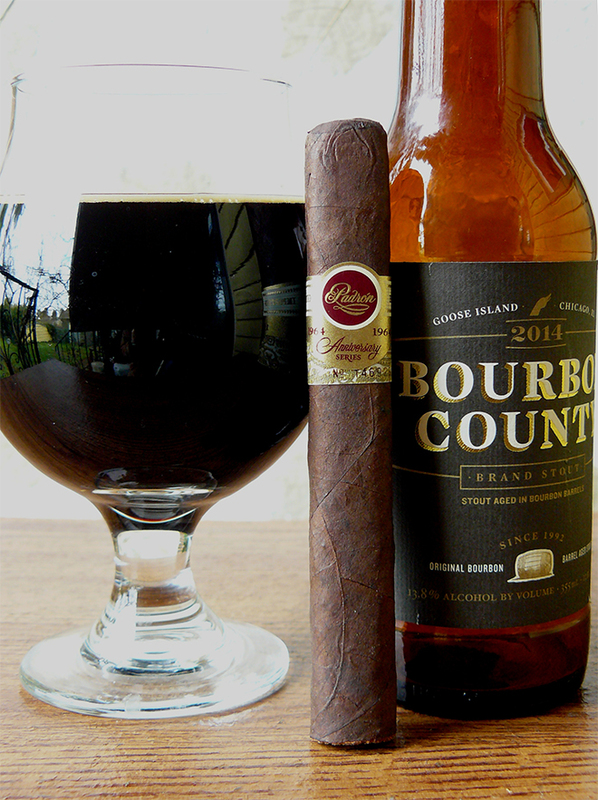 The Padrón 1964 Anniversary Series maduro Exclusivo has entered the final stretch with a rather sudden ramp-up into the medium-full range, as the flavors have become toastier and bitier, and either the strength of the cigar has grown or the ABV of the beer is starting to have an effect on me. Probably more of the latter. The sweetness has receded, yet there is no harshness, even though the pepper has come on pretty strong at the very end. The 1964 smokes absolutely cool down to the nub, even though it has gotten a bit squishy. With this being my final review of the year, I wanted to finish things off with something special, and indeed, it was. 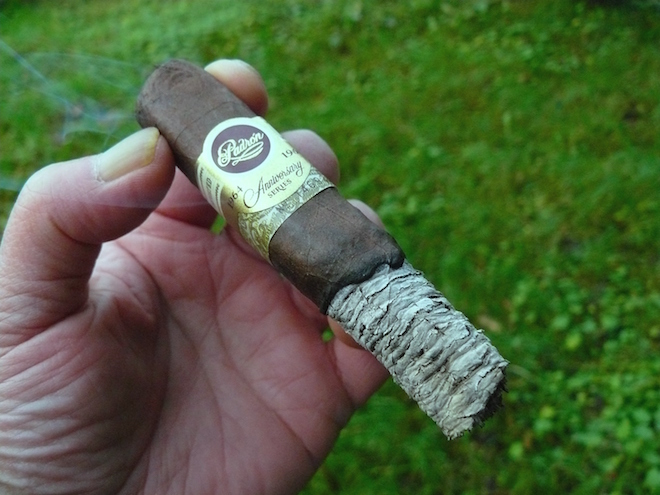 The Padrón 1964 Anniversary Series maduro Exclusivo was a thoroughly enjoyable smoke, one with a great amount of flavor and complexity, along with terrific construction and burn. The price is absolutely warranted and this cigar could even be considered to be underpriced (shh!). It’s not the prettiest girl at the dance, but it’s a perfect example of how beauty runs skin deep. As with the cigar, having a great friend who will always see to it that you can try out beers that are normally beyond your reach is a wonderful thing, and this one came from the man himself, Tony Casas. As he has pointed out before, “It’s with good reason that this limited release sells out so quickly. Aged in Bourbon Barrels this Imperial stout clocks in at a whopping 13.8% ABV. The beer is thick, almost syrupish and the mouthfeel is similar. Right away you’re hit with the bourbon and the booze as it starts to smooth out the spice, vanilla, sweetness and chocolate begin to creep in while it finishes boozy, and creamy with lots of bourbon and spice notes.” Man, if I had a few more of these, I would save one to pour over a bowl of French vanilla ice cream. I was afraid that this beer would be a little much for the Padrón, but it was a great pairing. I want to extend a big “Thank you!” to both Josh and Tony for making this revew possible, and a big “Happy New Year!” to everyone out there!